While Muslims born in the United States and their immigrant counterparts share a pride in being American, U.S.-born Muslims are less likely than immigrants to feel comfortable with their place in broader American society. Muslim immigrants and those born in the U.S. both overwhelmingly express pride in their national identity. About nine-in-ten U.S.-born (90%) and foreign-born (93%) Muslims say they are proud to be American, according to a 2017 Pew Research Center survey. Like the larger American public, majorities of both U.S.-born Muslims and Muslim American immigrants say they believe people who want to get ahead can do so with hard work (65% and 73% respectively). Roughly six-in-ten of all Americans (62%) share this belief. However, U.S.-born Muslim Americans are less likely than immigrants to perceive positive feelings from their fellow Americans. Indeed, just three-in-ten U.S.-born Muslims say the American people are friendly toward Muslim Americans, compared to 73% of immigrants who feel this way. 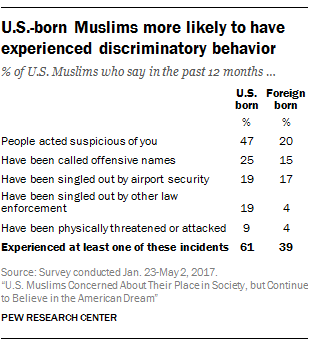 And U.S.-born Muslims are more likely than their immigrant counterparts to say there is discrimination against Muslims, and to say they have personally experienced at least one of several specific types of discrimination, such as people acting suspicious of them or calling them offensive names, being singled out by airport security or by some other law enforcement, or being physically attacked or threatened. Nine-in-ten (91%) U.S.-born Muslims say there is a lot of discrimination against Muslims, compared with 65% of immigrants who say this. And six-in-ten U.S.-born Muslims (61%) say that in the past 12 months they have experienced at least one of the specific types of discriminatory behavior asked about in the survey, compared with 39% of immigrants who say this. As might be expected, those who have personally experienced discrimination are more likely to say that there is a lot of discrimination against Muslims. U.S.-born Muslims also are more likely than immigrants to say that political institutions are unfriendly toward their group. For instance, most U.S.-born and foreign-born Muslims say the Democratic Party is “friendly” or “neutral” toward Muslim Americans, but immigrant Muslims are particularly likely to feel this way. Likewise, U.S.-born Muslims are more likely to say the Democratic Party is unfriendly (23%) than foreign-born Muslims (5%). And while many U.S. Muslims say that the Republican Party is unfriendly toward Muslim Americans, seven-in-ten U.S.-born Muslims hold this view, while only half of foreign-born Muslims say this. The same holds for views on President Trump. Large majorities of U.S. Muslims say that Trump is unfriendly toward Muslims, but U.S.-born Muslims are more likely to hold this view (85% vs. 67%). Claire Gecewicz is a research analyst focusing on religion at Pew Research Center. Besheer Mohamed is a senior researcher focusing on religion at Pew Research Center. 5 facts about Muslim Millennials in the U.S.
Muslims more likely than Americans overall to say blacks lack equal rights in U.S.